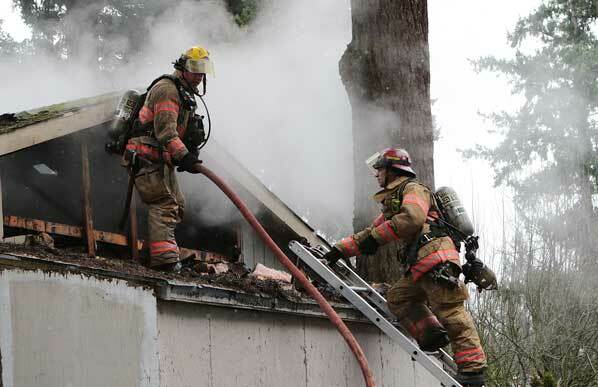 Firefighters begin the challenging mission of putting out a fire in an outer East Portland garage. Numerous neighbors called the 9-1-1 Center reporting smoke and fire erupting from either a house or a garage at 12406 SE Schiller Street. The calls came at 2:22 p.m. on February 4. The first challenge faced by arriving Portland Fire & Rescue (PF&R) crews was navigating this unpaved, potholed, and muddy segment of SE Schiller Street, east of SE 122nd Avenue. Finding the inside of the burning garage packed with personal items, firefighters pull up a line to shoot water into the attic space. Firefighters riding PF&R Mill Park Station’s Engine 7 and Truck 7 were followed in by those from Lents Station 11’s Engine Company. The reports back to dispatch confirmed flames showing from a building, about 20 feet behind the home at that address. 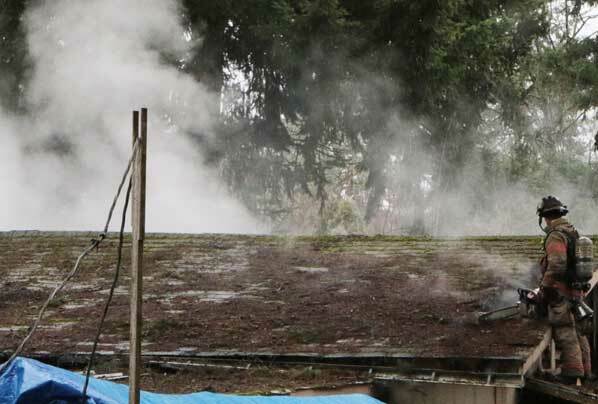 While some firefighters began hooking up water supply lines to Engine 7 to get started on the fire, the Battalion Chief was alerted that a man had been on the roof of the burning structure, spraying the fire with a garden hose – and some first-responders began looking for him. The possible victim was later found uninjured. Crews shoot water inside the burning building after removing siding at the west end of the garage. Yet another concern was fire exposure risk to three duplexes located nearby, 100 feet west of the blazing building and separated only by two large trees on the property line. Still another challenge was that the back yard space between the house and garage was filled with objects, limiting crew access from that side of the burning structure. 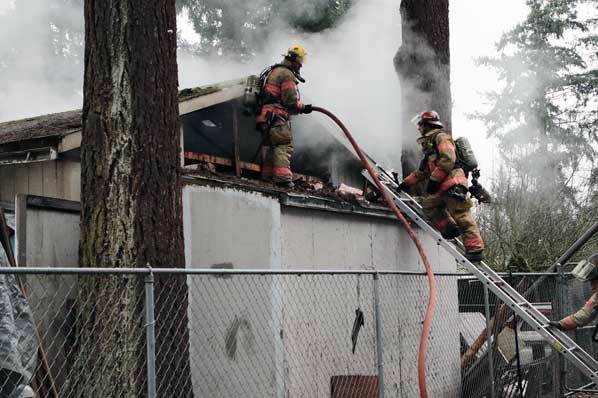 As the firefight continued, the Battalion Chief ordered crews off the roof after portions of it burned through. 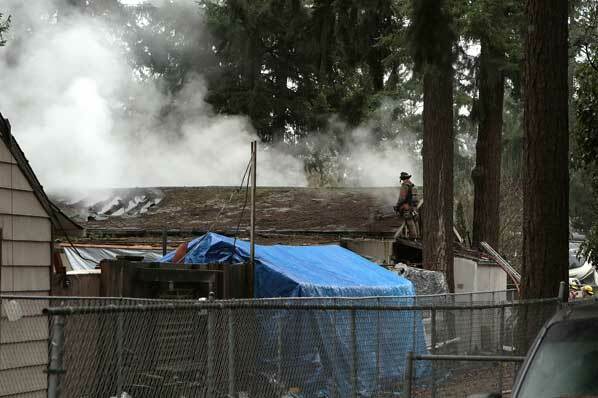 “Inside the structure, crews where hampered by stacks and piles of personal property that appeared to be fueling the fire; firefighters crawled over some of the piles to extinguish hot spots,” PF&R Public Information Officer Lt. Damon Simmons told East Portland News. After the roof caved in on the east end of the garage, firefighters used caution inside the building while putting out hot spots. A little after 3:00 p.m., the fire was declared substantially extinguished, with firefighters carefully working in and around the unstable building. While the fire remains under investigation, Simmons said preliminary information indicates that a stove may had ignited nearby combustible materials. “Especially in very cold winter weather, whether in a home or garage, make sure to keep all materials away from heat sources,” Simmons wisely reminded.